That said, don’t go into this expecting a martial arts movie; it’s not that and there are no high-flying displays of technical prowess. This isn’t Tony Jaa flipping, kneeing, and elbowing dudes in a pseudo-highlight real. Sauvaire shoots the fights, of which there are plenty, in handheld closeups, which accomplishes two key things. First, while he’s a fine actor and proficient in on-screen fisticuffs, wider shots would expose star Joe Cole’s technical limitations as a fighter, especially considering his opponents are much more seasoned and experienced in that realm. Second, it gives the action a raw, intimate feel. Being so close, it’s pressing and disorienting. Like protagonist Billy Moore being punched and kicked and pummeled, it gives the fights a personal, visceral demeanor. This places the viewer right there, mimicking being in a real fight, recreating the confusion, the panic, and the chaos that so often arises as another person attempts to bludgeon you into unconsciousness and you attempt to stop them. Based on a memoir of the same name, A Prayer Before Dawn follows Billy Moore (Joe Cole, Green Room), a British ex-pat in Thailand. 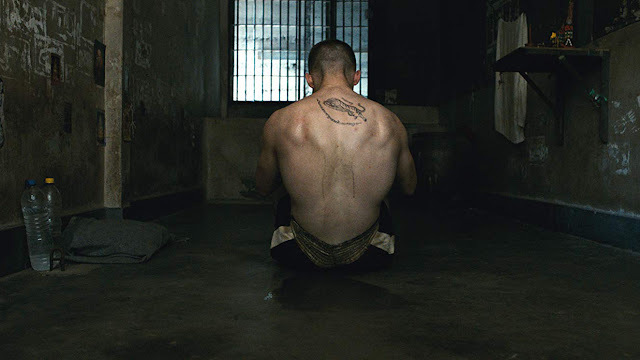 When he falls down a hole of drugs and addiction, he winds up in a notorious prison and must fight both his personal demons and to survive the vicious environment that tries to rip him apart. We’ve seen this often: physically fighting as a larger metaphor, as a tool for redemption. And there’s a good reason for that. But though it offers a familiar narrative, that doesn’t lessen the weight or impact. This is humanity stripped raw, torn down to the beams. Sweat and desperation ooze from every pore of Cole’s body as he delivers a ferocious, gut-punch of a performance. I can’t explain how thankful I am Cole wound up in this role, not Charlie Hunnam, who was originally slated. This is all simmering rage and fierce exteriors that belie inner anguish. 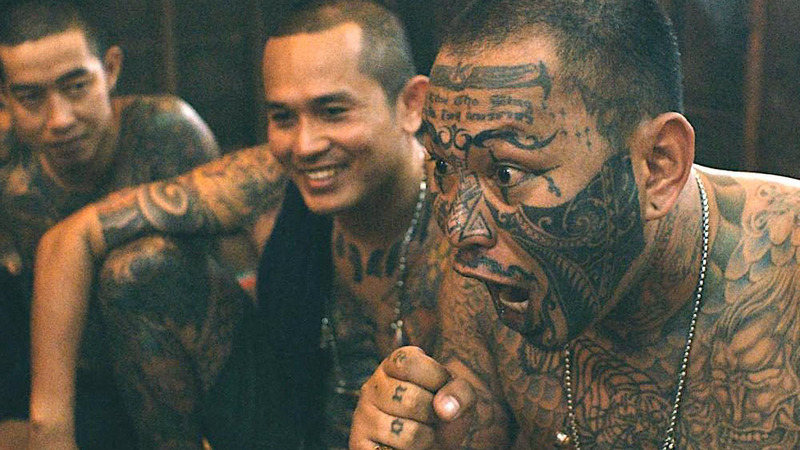 Adding an extra layer of grim realism, Sauvaire and company filmed in actual Thai prisons and largely used actual inmates. Movies have employed similar tactics before, often with mixed results, but here, they achieve the desired effect. The walls close in, the air gets close, bodies pile on top of one another, and when the cell door clicks shut, it creates a deep, primal tension and it’s impossible to shake the feeling of being trapped with no escape.